As you age your eyes have a greater and greater risk of sight threatening diseases. Many of thse conditions can lead to irreversible blindness if they are not prevented or detected early. Many of these conditions also have almost no symptoms in the early part of the disease. However, regular trips to your optometrist can mean finding diseases such as glaucoma, macular degeneration, diabetic retinopathy and others in early stages before they have a chance to damage your eyes permanently. 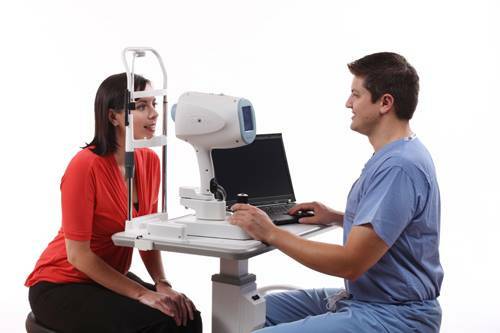 Therefore, in an effort to provide a more thorough eye exam, our practice has recently joined with other elite practices now performing comprehensive eye exams using the iVue® SD-OCT by Optovue. This exam is like an MRI of the eye, the iWellnessExam™ reveals ocular anatomy and signs of disease in exquisite detail. This breakthrough technology allowsus to examine your eyes with unprecedented clarity, structure that is invisible using traditional methods. This unique technology can help detect potentially vision threatening, as well as systemic diseases in their very early stages, when they are most treatable. As part of your pre-exam testing, our technician will perform the iWellnessExam which your doctor will review with you during your examination. As always, don’t hestitate to ask if you have any questions about the test or your overall eye health during your exam. Our optometrists in Costa Mesa, CA will always take the necessary time to answer your questions. New patients from Orange County, Corona Del Mar and Irvine, CA are welcome!